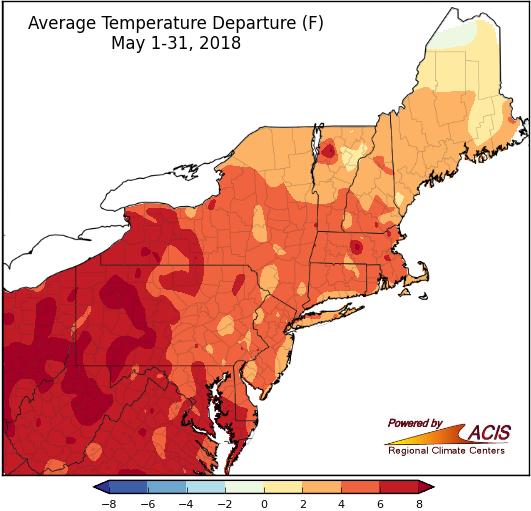 May brought above-normal temperatures to the entire region, which was quite the contrast from April when each of the major climate sites in the Northeast experienced below-normal temperatures, causing many people to wonder if spring would ever come. Six locations across West Virginia, New York and New Jersey had their warmest May on record. Throughout the region, 33 of the 35 major climate sites registered this May amongst their ten warmest on record. Temperature departures ranged from 9˚F above normal in Elkins, WV to 1.4˚F above normal in Caribou, ME. Warmer-than-normal temperatures were prevalent throughout the entire Northeast during May. Heavy rainfall during the middle of the month led to severe flooding in parts of Maryland and West Virginia, which contributed to above-normal precipitation for about half of the climate sites in the region. Although some locations near Washington D.C. received over 200% of normal precipitation over the course of the month, there were portions of New England and New York which experienced opposite conditions. Portland, ME only received 0.79 inches of rain for the entire month, which was 20% of normal for that area. 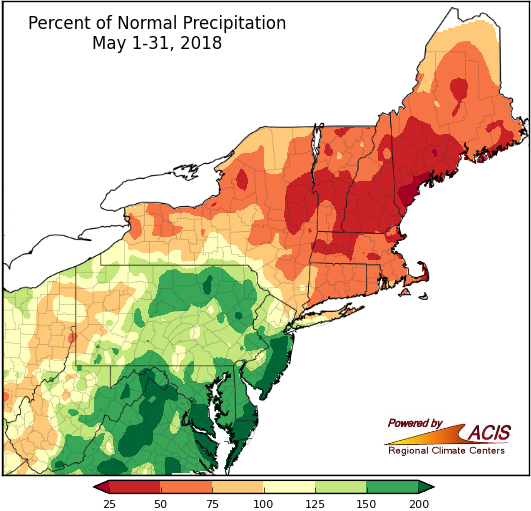 Many areas north of Pennsylvania received less precipitation than normal, but the southern half of the region received a much higher percentage of normal precipitation during May. Four of the 35 major climate sites in the Northeast recorded over 8 inches of rain during the month near areas where severe flooding occurred. During meteorological spring, which encompasses the months of March through May, four locations received record amounts of snow. 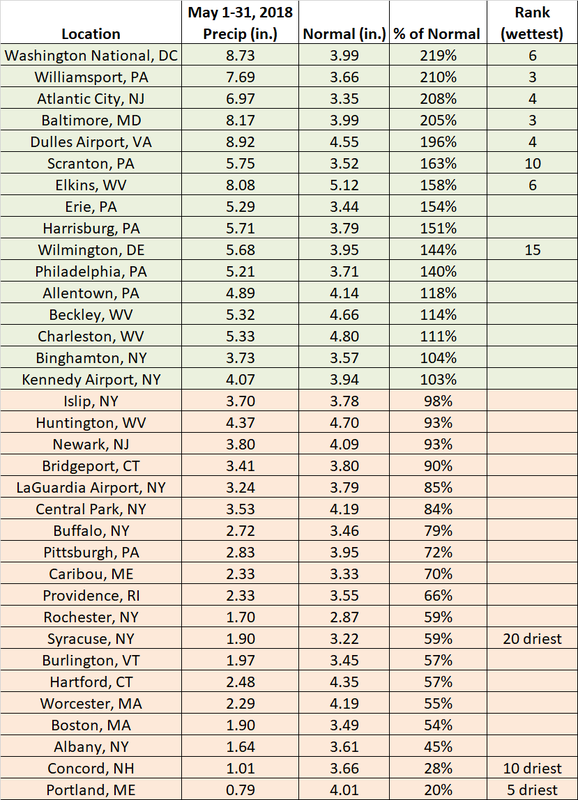 All but one location received more snow than normal during these past three months, with Williamsport, PA receiving just 0.2 inches below normal. 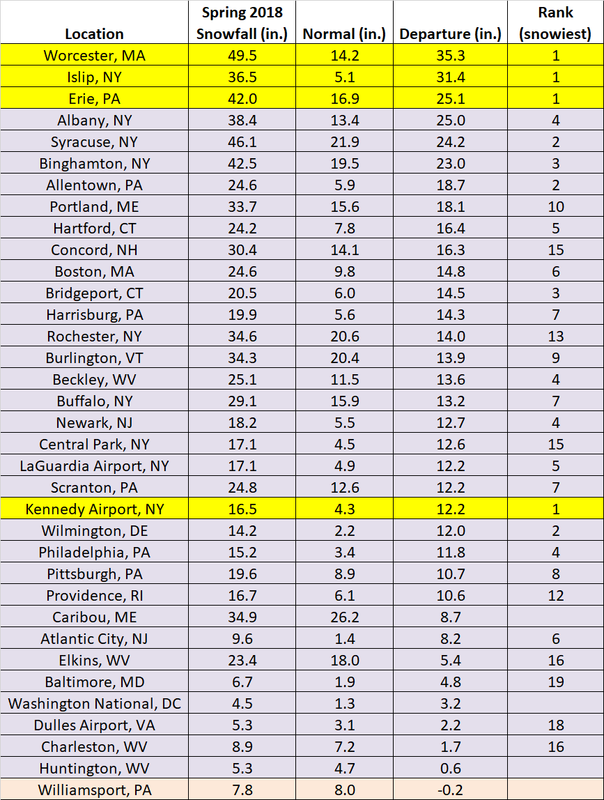 Across the entire region, 23 major climate sites ranked this spring amongst their top 10 snowiest on record. A snowy couple of months led to four major climate sites ranking this as their snowiest spring on record. 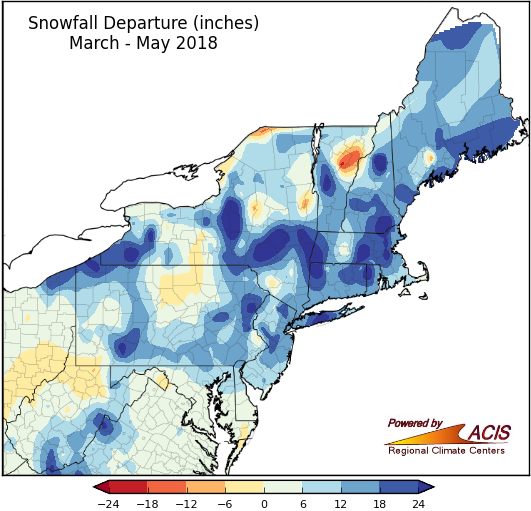 Snowfall departures from normal ranged greatly across the whole region during meteorological spring. The Northeast received four Nor’easters within four weeks between late February and the end of March, causing spring to feel a lot more like an extended winter for many in the region. 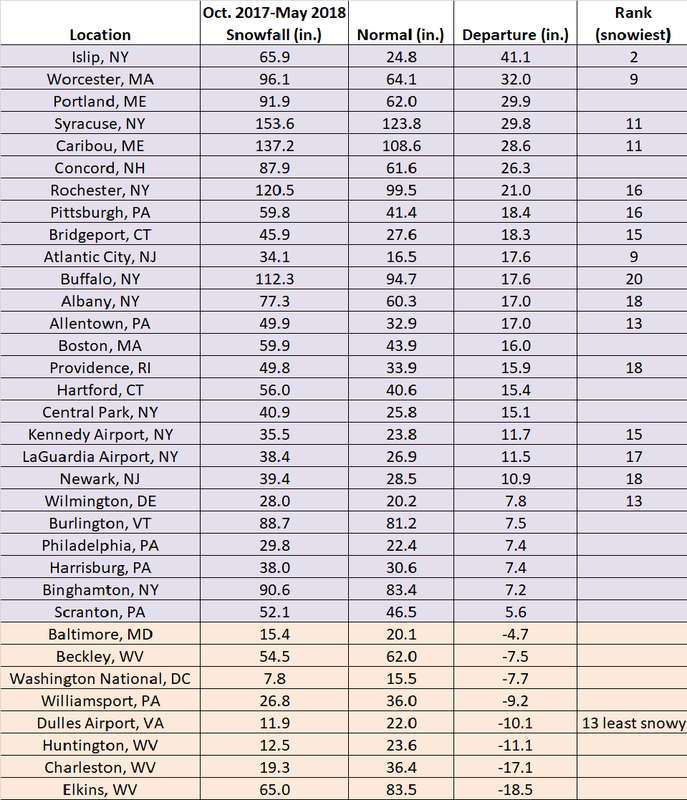 There were five locations that received more snow during the three months of meteorological spring than during meteorological winter, including Harrisburg, PA, Wilmington, DE, Washington, DC, Worcester, MA, and Islip, NY. 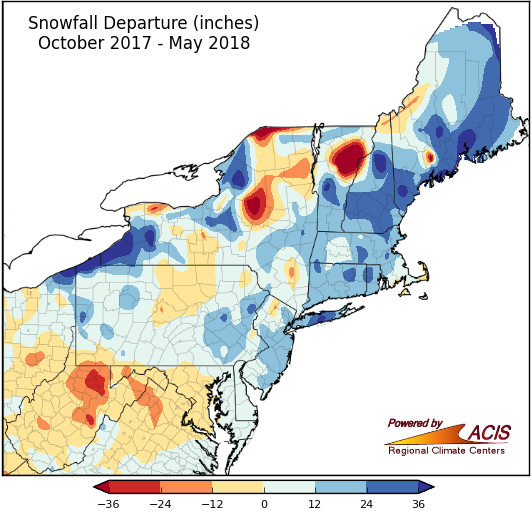 Eastern New England received above-normal amounts of snow from October through May, with lower-than-normal amounts in states towards the southern part of the region. Seasonal snowfall totals varied throughout the region, with portions of New England and New York receiving above-normal amounts of snow. The Northeast recorded temperatures that were typical to slightly cooler than normal for spring. Seasonal temperature departures ranged from 0.9˚F above normal in Caribou, ME to 1.8˚F below normal in Syracuse, NY. 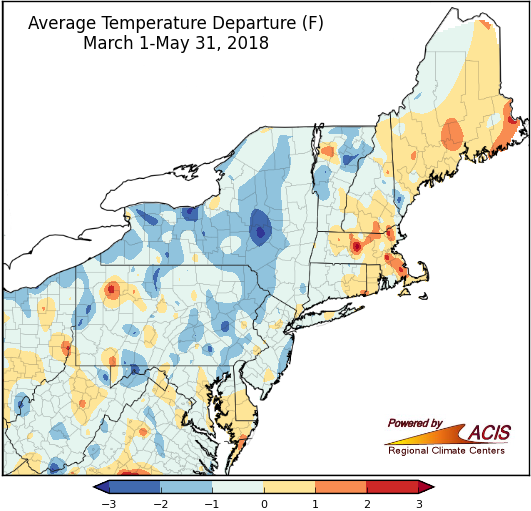 March and April brought colder-than-normal temperatures to most of the Northeast, but the warmer weather in May helped to balance out the average temperatures this spring. 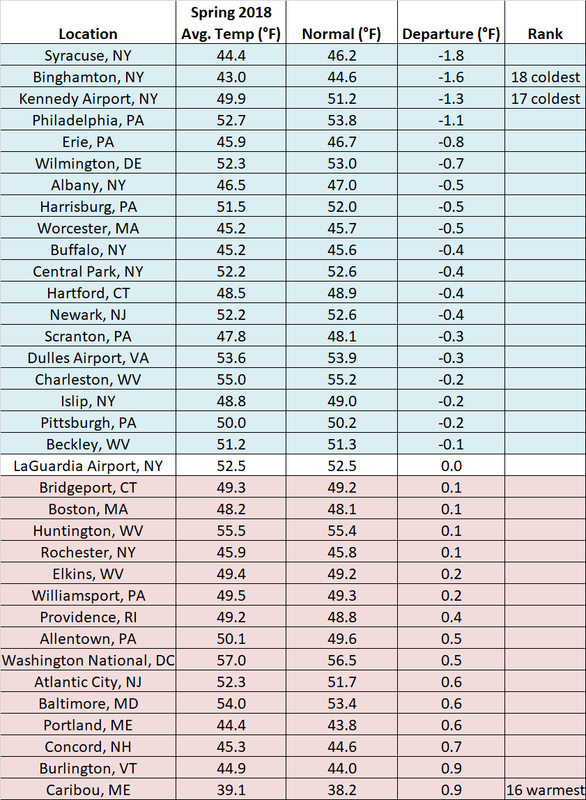 Temperatures in the Northeast were pretty evenly split, with slightly more than half of the 35 climate sites recording colder-than-normal temperatures during spring. Springtime temperatures in the Northeast were near normal at each of the major climate sites. The combination of numerous snowstorms in March, along with April showers helped make this spring wetter than normal for much of the Northeast. As the season went on, severe weather and heavy rain in May also contributed to a higher percentage of normal precipitation throughout the region. 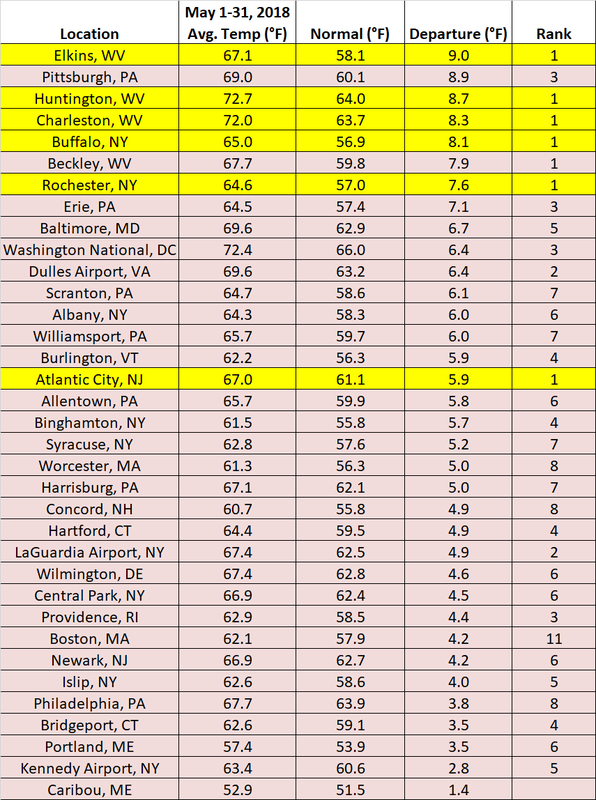 Eleven climate sites ranked this spring amongst their 20 wettest on record. 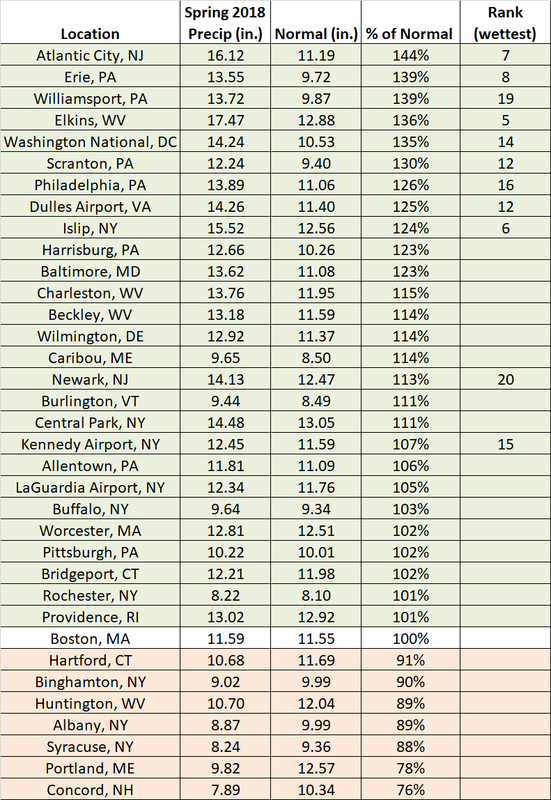 Spring precipitation across the Northeast ranged from 144% of normal in Atlantic City, NJ to 76% in Concord, NH. 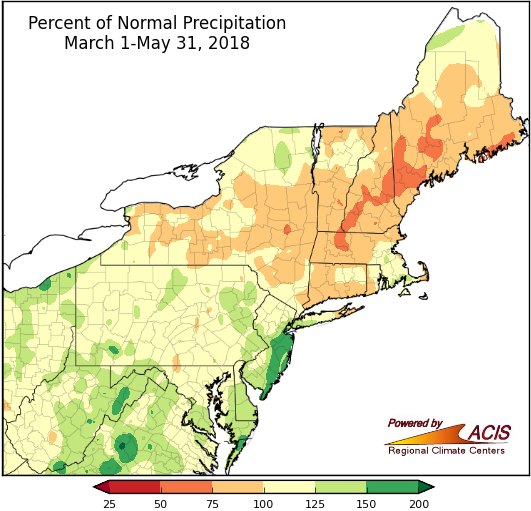 Much of Pennsylvania, New York and New England experienced lower percentages of normal precipitation during spring, compared to the southern part of the region. The Climate Prediction Center (CPC) has released its latest temperature and precipitation summer outlooks. 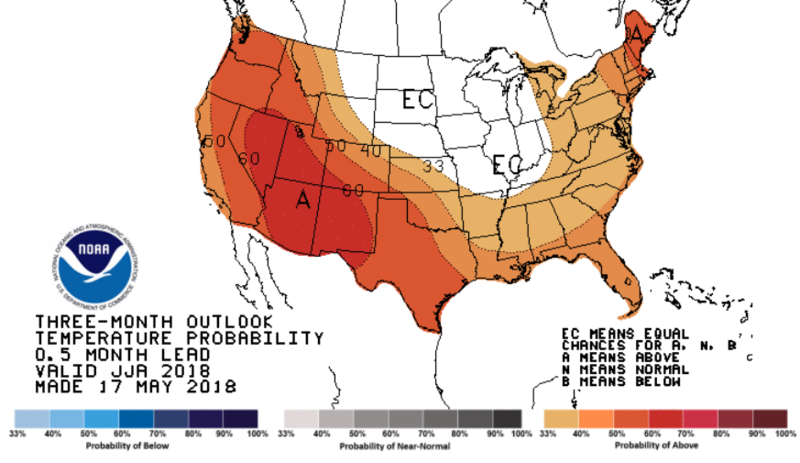 The predictions suggest that there will be increased chances of above-normal temperatures for the entire East Coast, particularly northeastern New England. 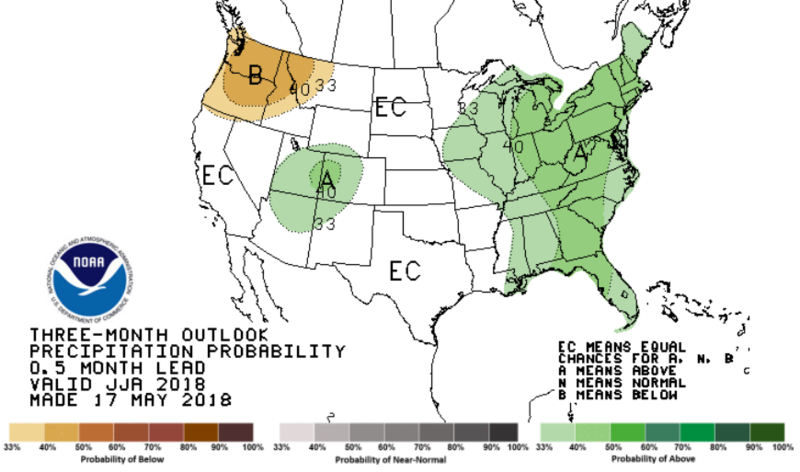 According to the CPC outlook, much of the eastern half of the country shows increased chances of above-normal amounts of precipitation for the next three months, especially for areas in the central part of the Northeast. The CPC outlook suggests there are increased chances of above-normal temperatures during the summer months. Increased probability of above-normal precipitation is predicted for June through August.